The Basketball Spotlight MDC 7th Grade Division has some serious talent. Here’s a look at the top performers from the weekend. Tarik Watson Forward (East Coast Elite)- Watson is getting better every time we see him. This 6’4 Class Of 2024 player playing up in 7th grade has been dominating all season. He showed that he can more than compete at this level. Tarik was able to dominate on the boards and inside play. His game is evolving and he is able to knock down the foul line jump shot on the regular basis; he also has tremendous passing ability especially when the double team comes to him. Tarik might be one of the best 6th graders we seen in a long time. Akil Watson Guard (East Coast Elite)-Watson is long slender player with a lot of wiggle in his game. He stands about 6’3 and has the ability to put ball on the floor to attack the rim. He has a soft stroke from the three-point line and showed that touch in the semifinal game leading his team to the championship game. 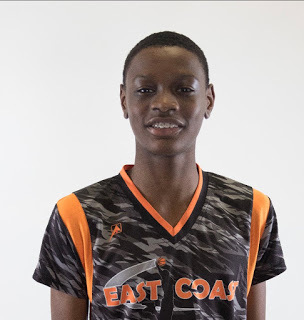 He is becoming a better defender and rebounder for his East Coast team. We have seen a lot of growth from him on the circuit and look forward to seeing more. Justin Bonsu Guard (East Coast Elite)- Bonsu is a streaky shooter that saved his best performance for the championship game. He tallied 10 pts while shooting perfect from the field. He is becoming the shooter that this East Coast team needs. If keeps knocking down shots this team is going to be hard to beat. 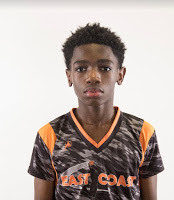 Korbyn Samuels Guard (East Coast Elite)-Samuels is a shifty point guard that can get anywhere he wants to on the floor. He is a tremendous passer that always seem to be thinking one step ahead the defenders. His crisp pass puts his teammates in easy positions to score. He growing as a player and like what we see. 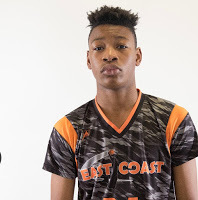 Noah Barnett Forward (East Coast Elite)-Barnett is a fresh face but showed that he can be dominate. He stands 6’6 tall and has the ability to score inside, block shots, and rebound with ease. Noah is a player that game can get to the next level if he continues to work hard. He has the ability to handle the ball and get to the rim or pull up for a mid-range jump-shot. He gave his team some quality minutes in the championship game at the Memorial Day Classic. Dante Green Guard (NY Rens)-Green is becoming a prolific scorer and he showed that this last weekend in the Memorial Day Classic. He is able to get anywhere he wants to in the floor with his crisp ball handling. He is the team leader that generally makes the big shots in the big moments. He has a strong body that he uses to attack the rim at will. Green has improved his jump shot and is able to knock down the three on a consistent basis. He put up a great fight in the championship game but came up one shot short. We like the growth we have seen in him. Christian Bliss Guard (NY Rens)- Bliss is a solid guard that has grown a few more inches since we last saw him. He has the ability of knocking down tough shots when his team needs him to. He is a very poised player and usually plays under control. His understanding of angles gives him the ability to attack the rim and finish with an array of moves. His game continues to grow and we look forward to seeing more of Christian. Louis Mathurin Guard (NY Rens)- Mathurin showed that he can get to the rim at any time using his strong body. He can play on the perimeter or take smaller guards to the box and dominate them. He has a nice turnaround jumper that he uses; has the ability to knock down the open shot on smaller guards. Jayden Reid Guard (NY Rens)- Reid has a great feel for the game and has the ability to hit tough shots on the court. He is a shifty guard that has a lot of wiggle in his game. He can get to basket usually at will and finish with some high-level moves. He is improving his ability to knock down the jumper on a more consistent basis. Frank Wilson Forward (NY Rens)- Wilson is a slasher that is tall and agile. He can attack the rim at will but usually chooses to play under control and take good opportunities. He has a very nice pull up from about 8-10 feet. His ability to finish around at a high percentage is tremendous. We like the upside to his game.